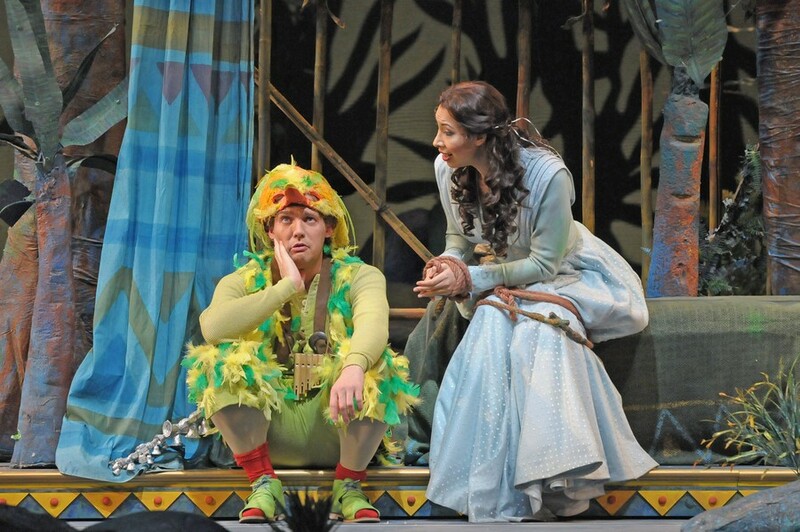 Papageno (Stephane Degout) and Pamina (Nicole Cabell) sing a little ditty. For a work featuring wild beasts, vengeful queens, and hostile savages, Lyric Opera of Chicago’s Die Zauberflöte (The Magic Flute) offers a pleasant and surprisingly tame night at the opera. Using August Everding’s classic 1986 interpretation, Lyric presents a version of Mozart’s family-friendly fairytale classic that’s hard to be unhappy about. Flute tells the story of a prince, Tamino (Alek Shrader), who is asked on behest of a fiery Queen of the Night (Audrey Luna) to rescue her daughter, Pamina (Nicole Cabell), from the evil Sarastro. With the aid of scrappy bird catcher, Papageno (Stéphane Degout), and the titular magical instrument, Tamino starts his quest, only to discover, in true fairytale convention, that his journey is really about character development. Lyric’s rendition of this tale is highly polished and clean, never daring but always enjoyable. Most voices are very good, some excellent. Stéphane Degout’s Papageno is particularly fine. While the wily bird catcher is usually cast for acting skill rather than vocal prowess, Degout combines his beautifully resonant baritone with a keen wit that is brash but always lovable. With his powerful, refined voice and on- (and off-) stage antics—he even usurped the conductor’s baton—Degout is definitely the audience favorite. Luna’s soprano, which barely navigated the extreme ranges. Fortunately, the wonderful Nicole Cabell imbues her character, Pamina, with a delicate but clear, smooth but emotional soprano, a perfect counterpart to Sir Andrew’s orchestra. Her second-act aria, “Ach, ich fühl,” was show-stopping with its passion. Alek Shrader, making his Lyric Opera debut in this performance, also lends a beautiful voice to the mix. His powerful but never overwhelming tenor blends flawlessly with Cabell’s soprano, and their final duet, “Tamino mein,” is blissful. The production itself has multiple moving sets and fun touches (including a floating ship), and director Matthew Lata seems practiced at keeping the action moving. But the sullen palate of sea-blues and -greens, while initially creating a mystical effect, is too dark to match the lighthearted mood of the opera. The sometimes-jarring juxtaposition is confusing, especially when it is matched with equally somber period clothing. Delightfully costumed animals dancing across the stage provide low-tech entertainment, but high-tech touches remain firmly from the ’80s. When Sarastro’s brotherhood requires Tamino and Pamina to undergo the trials of the gods in order to go back home, the effect is less scary than a reminder of opera’s dated technology. Lyric Opera’s The Magic Flute offers plenty of superb song and spectacle, proving that it is the Midwest’s most refined and consistently excellent opera company. But it could still do with an updated interpretation. Lyric already has excellent singers, a polished orchestra, and a beautiful space. A new interpretation could not only put all of these elements to use, but it could also give them a new sparkle. The Magic Flute will probably never disappoint its longtime patrons, but a fresh update could turn something good into something truly great and attract a younger audience. After all, Mozart was the pioneering composer of his time; surely he would approve of an equally original and new production that would allow his opera to speak to contemporary audiences as it did over two hundred years before.